How would you describe a person who was an embodiment of several personalities—scientist, science manager, educator, and science communicator—all rolled into one? Yash Pal, who passed away on July 24, was such a person. He was one of the few Indian scientists who did so much in so many different fields and with such fervour. 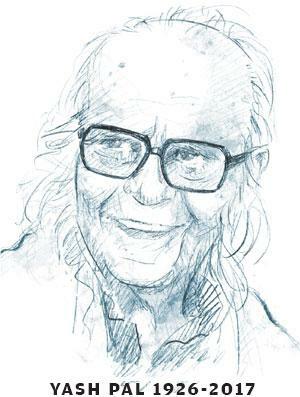 Born on November 26, 1926 at Jhang (now in Pakistan), Yash Pal was a physicist by training and spent almost 35 years doing research at the Tata Institute of Fundamental Research, Mumbai, where his main areas of research were cosmic rays and high-energy physics. But he is better known for his contribution to India’s space programme. He was instrumental in setting up the Space Applications Centre in Ahmedabad, which has played a pioneering role in spreading development communication through satellites in the country. He was the key person to plan and execute the year-long Satellite Instructional Television Experiment (SITE) during 1975-76 that brought satellite-based TV to 2,400 villages in six states, at a time when only seven cities in India had local television stations. SITE gave a new dimension to educational communication in a vast and multilingual country like India, the benefits of which we are reaping today. In the early 1990s, Yash Pal became a public icon through the Doordarshan serial “Turning Point” where he explained the discoveries of science to the viewers. He had his own unique style of explaining science —not giving direct answers, but making the viewers think and understand to get to the answers. He laid emphasis on independent thought, and was blessed with innovative ways of problem-solving. 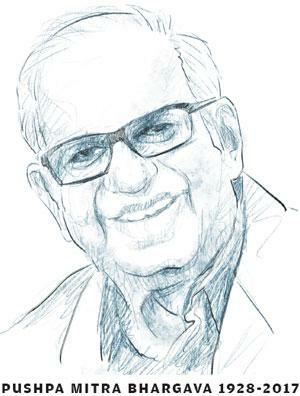 Reforms in education were a ceaseless concern for Yash Pal throughout his life. He always felt there was something seriously wrong with our education system, and he put in relentless efforts to find solutions. His teaching style was more on human and social interaction, rather than a bookish emphasis. When he was chairperson of the University Grants Commission, he tried to change university education in a radical way when he mooted the idea of shutting down colleges and universities for a year to enable the educators to reach out and interact with people and rewrite the courses. He did not succeed in his mission, but still, the concern for bringing about a change in the education system never left him. Pushpa m Bhargava, PMB to his friends, was a scientist of the old school. By that I mean that he did not confine himself to his particular scientific field, but had wide-ranging interests in the broader domain of science, as also in the arts, aesthetics and politics of his time. Bhargava’s scientific temperament was such that he had a commitment to rationalism. He was an active participant in campaigns against superstition, irrationality and obscurantist beliefs and supported people who fought for these values and the scientific approach. Bhargava was trained in chemistry. He later married his interests in chemistry with biology via biochemistry and became a formidable scientist in the broader field of cell biology. As a scientist, he was a liberal in the classical style, concerned about the environment and espoused public causes. Apart from his interests in the world of academics, he also enjoyed music and dance performances and other cultural offerings of Hyderabad where he lived. The founder director of the Centre of Cell and Molecular Biology (CCMB) in Hyderabad, Bhargava set high standards for the institution that he was founding. He wanted to make CCMB a world class institution, a leading research organisation and in that he succeeded. What is not so well-known of his CCMB association is the personal interest he took in its design and construction. He used to be on the site frequently, inspecting the quality of the construction and the aesthetics of what was being built. He would check the finish of the walls, the quality of the fittings, the placement of facilities in the labs and ensured that the workplaces were attractive and comfortable. CCMB is not only a scientific landmark, but it is also aesthetically appealing, a place where people can enjoy their work. Bhargava mentored many young scientists and reposed his faith in the next generation, helping them to get grants to start their work and put them in touch with other scientists who could be helpful. I had the pleasure of knowing PMB from the early 1990s, when I had just returned from the University of Heidelberg where I worked as a scientist for many years. From the early years, I recall a lovely conference he had organised at the M S University in Baroda. It was an exciting meeting that brought together an eclectic mix of scientists and people from the arts and culture world, including painters, dancers and musicians. It brought together young people from the media who were doing interesting investigative work, students, of course, and people from the government and policymakers. The discussions were across the board and exhilarating. Gene Campaign had the privilege of having Bhargava on its board. We benefitted in innumerable ways from his guidance and practical suggestions. He was a hands-on board member, didn’t stand on any formalities and was always accessible. You could call him at any time if there was something urgent that needed to be sorted out. PMB enjoyed life. Among his endearing traits was his love for good food, and he would enthusiastically take his guests to eat Hyderabadi biryani and khubani ka meetha, the two iconic dishes of his home city. (This article was published first in the 16-31 August issue of Down To Earth).